There are two parking ramps attached to the building. Daily parking is free for the first two hours and then $3.00 daily thereafter Monday – Friday from 7:00 a.m. to 5:00 p.m. The ramps are free after 5:00 p.m. during the week nights and free all day on Saturday and Sunday. If there is a ticketed event in the arena on a weekend, there is a $5.00 event charge. 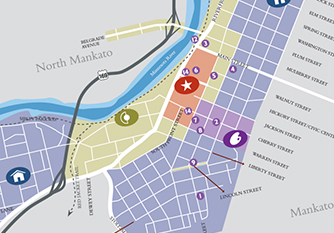 Mankato City Center Hotel – Parking is free for guests in the hotel parking ramp. For others, parking is free for the first two hours and $3.00 daily thereafter. Parking is free in this ramp on the weekends. Hilton Garden Inn Mankato – Parking is free for guests in the hotel parking ramp. For others, parking is free for the first two hours and $3.00 daily thereafter. Parking is free in this ramp on the weekends. Free two hour parking is provided on the street and in City Center lots during the weekday, with free parking all day on weekends. Parking above the gate arms in City Center Ramps is free for the first two hours during the weekday Monday-Friday from 7:00 a.m. to 5:00 p.m. and $3.00 daily thereafter. Nights and weekends are free. Overnight parking on public streets is not allowed and your vehicle may be towed. Your short-term parking needs are met with two hour on-street parking and off-street City Center lots and ramps. When using on-street parking during business hours on weekdays, pay attention to parking signs to determine if parking is allowed and the amount of time allotted for that space. Violators are subject to parking fines. For parking in the ramps above the gate arms, many businesses downtown offer pre-paid coupons or validate your parking ticket. This will enable you to spend all day in the downtown area without having to pay a parking fee. Credit card payment and cash are accepted in all City Center parking ramps. There are no parking attendants; the system is completely automated.